Wherever cranes reside in the world, folktales, myths and legends abound. From giant cranes battling pygmies in reed beds along the Nile to Taoist sages riding “crane-back” across painted Chinese landscapes, these majestic birds never fail to capture our imagination. Today, endangered cranes don the mantle of “flagship” and “umbrella” species, furthering the goals of the conservation movement. A flagship species is one selected to act as an ambassador for a defined habitat or environmental cause. The whooper’s near-demise in the 1940s has invested it with added symbolic heft as an emblem of civilization’s changing relationship with nature. An umbrella species is one with large areal requirements for survival. By protecting whooping cranes we automatically safeguard a host of perhaps less glamorous plants and animals tied to their extensive home ranges. In this way, the charismatic crane acts as a modern messenger and guardian, bridging the emotional and communication gap between past, current and future generations by offering us striking metaphors for the vanishing wilderness and cogent reasons to preserve our natural heritage. Enjoying their heyday during the Pleistocene, whooping cranes once numbered more than 10,000 before European settlement of North America. The birds continued to be widespread — though never common — well into more recent times. By the end of the Civil War, however, a mere 500 to 1,400 whooping cranes were estimated to remain in North America. Soon after, their numbers began to plummet, with birds steadily disappearing from the heart of their north-central U.S. breeding range. By 1938 they had reached a nadir of only 14 adult birds in the only natural wild population that would survive, one that wintered near Rockport. Many people declared the whooping crane effectively extinct — one of the walking dead whose genetic time was up. But the Lazarus bird fooled the experts. It’s been a slow and precarious labor of love restoring the population to safer numbers. After almost seven decades of concerted conservation efforts in Canada and the U.S., the Aransas population today numbers just over 250 birds. With a proud bearing and elegant trim of sails, the whooping crane stands just under 5 feet tall and is the color of shimmering white mist. Males and females look alike, though females are slightly smaller. The glistening white tertial feathers of the folded wings drape elegantly over the hidden tail and black wingtips, immediately distinguishing them from great egrets. Sporting a crown of carmine and black, fierce yellow eyes and a red mustachial stripe behind a dark javelin bill, whoopers strike a regal if not disquieting pose. Their sharp eyes, upright stance, long legs and serpentine neck enable them to see great distances across an open marsh. To catch the delicate tracery of wing beats as they draw near, in a revolving whirl of white, black and carmine, is to witness beauty incarnate. Both haunting and compelling, the trumpeting call of approaching whoopers — ker-loo ker-lee-loo — sends shivers up the spine. Resonating within the 5-foot windpipe coiled neatly into the bird’s sternum, their vocalizations seem louder and more ringing than the harsher, more raspy tones of the sandhill crane. A male’s territorial warning call carries far across the marsh, keeping all would-be intruders at bay. A courting pair’s antiphonal “unison call” evokes the essence of primeval wilderness and all that is untamed, untrammeled and untouched. Where boreal forest taiga meets the spruce muskeg tundra of the Canadian subarctic at Wood Buffalo National Park, whooper pairs arrive in late April and early May to reclaim last year’s nesting territory. The male sets about immediately to secure the home front without use of ramparts or artificial moats. By constant vigilance, warning tattoos, agonistic displays and a strict sense of “personal distance,” he vigorously defends their 1-square-mile plot from all would-be interlopers in preparation for nesting. As with other crane species, whoopers mate for life, though pair-bonding may require up to two years to solidify. Separation does happen, after a life partner dies or when nesting attempts prove fruitless. Once the pair-bond is firmly established, however, partners remain fiercely loyal to each other, even in times of grave danger. Given the majestic stature of the pair, the courtship dance of the whooping crane is one of the great spectacles of the avian world. Dances begin on the wintering grounds in mid- to late December, marking the beginning of a new breeding cycle. In a series of elegant struts, leaps, spins and bows, the male initiates the first movements of the pas de deux. With head held high, he strides off into the shallow water, stretches mightily and raises his black-tipped satin-white wings high over his back, bending forward as he does so. Turning abruptly, he faces the female, bowing gallantly to her in invitation. The female answers his bidding by stepping ceremoniously into the water to join him. Leaping high into the air, the male executes a half-turn before alighting — an avian tour jeté. The female, her body stiff yet graceful, assumes first position and, like a prima ballerina, arches her neck, lifts and fans her wings and tertial plumes. At the downbeat heard by them alone, the two leap and toss, flutter and spin together, in a perfect frenzy of emotion. As they descend, springing lightly on stiffened legs, each bird touches the water’s surface with its bill, scooping and spraying the other in ritual ablutions. The rousing pas de deux has reached its climax. With heads thrown back and bills pointing skyward, they flap their wings in perfect synchrony, bouncing up and down in a graceful, buoyant rhythm. The male in dénouement may toss a stick into the air, a final token of spousal devotion. The bond is sealed! Whoopers typically build their nests along the margins of lakes or marshes, among reeds, rushes and sedges growing in about a foot of water. Large and solidly built, the nest may rise yet another foot above the water’s surface. The female lays two eggs. Both parents incubate and tend the eggs and young, which leave the nest soon after hatching. In good years, pairs may successfully raise two chicks, but this is exceptional. As a rule, only one chick survives long enough to fly south with its parents. Drought, fire and predation take their usual toll, with a 60 percent chick survival rate per nesting season. Sometime in mid-August, at the age of 2 months, the cinnamon-dashed youngsters begin flying lessons, tutored by attentive parents. Once the chicks learn how to fly, their odds for survival improve. Fully feathered now, they are able to keep warm and to escape predators. Whooping cranes evince a keen sense of flock identity and strong family ties throughout the annual cycle. Quietly poised along the water’s edge, the male stands guard over the female and her chick; he won’t hesitate to spear wolf, wolverine or lynx with his javelin-sharp bill in defense of the nest or young. Whooping cranes spend about three months per year in migration. High-altitude fliers, they are dauntless trekkers over vast distances, completing an exhausting 2,500-mile journey from Canadian subarctic wilderness to Texas Gulf Coast marshes. For great stamina, aeronautical skill and aerial grace, whoopers are unequaled. Days before departure, they gather up in small flocks, calling and circling in anticipation. On a day in late September, birds take off into the wind from a short running start, easily lifting their considerable bulk off the ground. Spiraling upward against a stiff wind, they head south-southeast following major waterways. Assuming a tight arrowhead formation, they then track due south on set wings, vanishing into the clear morning sky. As diurnal migrants, they take advantage of warm thermals to conserve energy by “spiral-gliding” downward most of the way to their wintering grounds at Aransas National Wildlife Refuge, arriving late October through mid-December. As with all epic heroes, battles are never-ending: some old, some unexpected, some looming in the future. Loss of habitat to coastal erosion, dredging, residential and urban expansion and wetland conversion continues to threaten the only wild flock of whooping cranes. Dams and water diversions pose additional threats along the migratory path, especially at critical stopover points. Crashing into power lines during spring and fall migration is another hazard, and wind turbines may pose an additional threat. Predation has always taken its toll, but there’s a new twist, as predators are better able to get to whooping cranes when water levels recede during periods of drought. Infectious diseases, cholera, tuberculosis, West Nile virus and avian influenza may strike at any time, especially on migratory stopping points shared with geese and other waterfowl. A succession of dry summers has continued to plague productivity on the Canadian nesting grounds. In Texas, disputes over water resources are likely to crop up more frequently as the human population continues to expand into regions where water supplies are stretched. That includes the Guadalupe River basin, which flows into and supports the whooping cranes’ wintering grounds on San Antonio Bay. 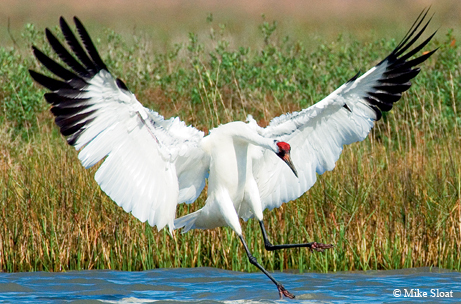 The U.S. Department of the Interior released a report in March 2010 warning that climate change with its attendant rise in sea level means the whooping cranes’ grounds at Aransas could be inundated should that scenario play out. Finally, the year’s total whooper population is still well below the minimum number thought to be needed for full recovery. Meanwhile, attempts to establish additional “wild” flocks have suffered heart-rending setbacks. The need to increase genetic diversity in wild populations is still pressing, and biologists fear that having all our eggs in the Aransas/Wood Buffalo nest basket is too risky. Plucky whoopers have shown an extraordinary ability to survive over the long haul of their recovery. With an invincible will to survive, a small but feisty cohort of experienced adults defied the odds of imminent extinction. They continued to nest successfully, slowly adding to their troubling low numbers. Despite periodic reversals, adult survivors kept a grasp on life. Their fierce nature offers, perhaps, the best hope that the species may yet prevail. True, the future looks much brighter than it did 70 years ago, but the whooping crane’s fate is by no means secured. 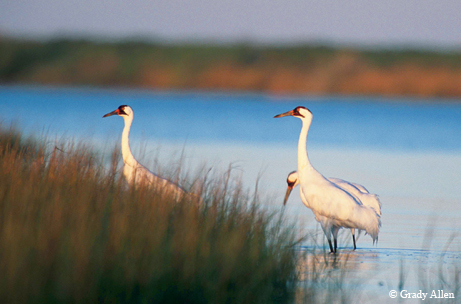 Without strong commitment and assistance from us, the whooping crane will not continue to thrive. Whoopers return to Texas in the fall. Pairs with newly fledged young in tow are often the last to arrive but are welcomed with the greatest joy. 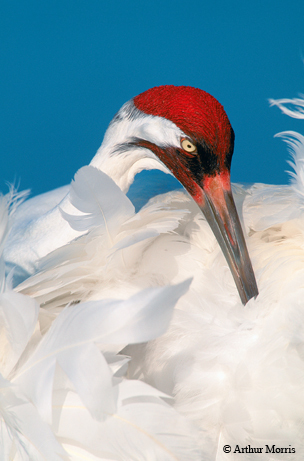 Texas plays a pivotal role in securing the future of the whooping crane, a veritable phoenix up from the ashes. Our guardianship extends over a lengthy swath of the annual cycle. Let us do what we must to assure their survival; let’s keep them sound and vigorous, ever returning them to Wood Buffalo to continue their ancient line — as totem guardians of our better selves.